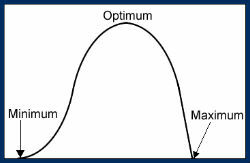 One of my favorite lessons to teach to runners is “Maximum versus Optimum.” These two words have different meanings, but are too often used synonymously. Maximum is the greatest amount possible. Optimum is the best or most favorable amount. As goal-oriented people, runners often want to push to their maximum day in and day out. That sounds great, but our body cannot constantly give its maximum without dire consequences and negative repercussions. We need to remember that our goals are positioned down a long road and that we must travel the optimum distance daily to reach them. You do not, for example, start a marathon at maximum speed and expect to maintain that pace all the way to the finish. Rather, you start at the optimum pace. In training, you must train optimally – not maximally. Too many dreams have been dashed by an overzealous training and racing schedule. When you are unsure about a planned workout or race, take a step back and ask yourself, “Is this maximum or optimum?” If you can do that, you will experience a much happier, healthier, and more satisfying running career. Good Luck and Happy Racing. ← Amanda Albrecht’s Marathon Debut!